I had a hankering for happy hour the other day, and while Portland is filled with a cornucopia of choices for cheap eats after the work day, I am pretty budget conscious these days. I’ve been trying hard to limit eating at bars and restaurants, despite inexpensive options some might offer. Instead, I visited my good neighbor Trader Joe’s to see if I could mimic the happy hour experience, recession style. Alcohol: Since Oregon’s archaic liquor laws prohibit selling hard liquor in grocery stores, I had to stick with wine or beer. 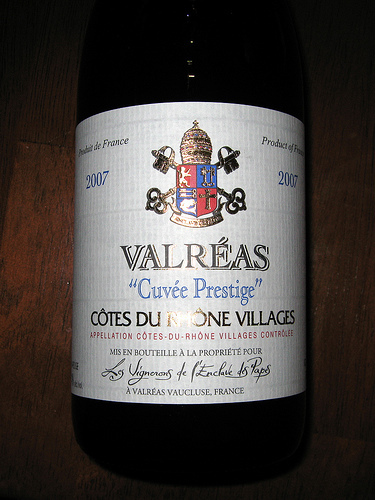 Beer from a bottle didn’t seem quite conducive to the happy hour experience so I chose a bottle of Valreas Cuvee Prestige from Cotes du Rhone for $5.99. The wine was delicious, and way more drinkable any bar’s house red. Appetizers: Trader Joe’s knows frozen food. Spanikopita, mini quiche, empanadas. Even taquitos. I went for the samosas for $3.29 and a jar of mango chutney for $2.99. The samosas were crispy but not too greasy. Just the right amount of salt and fat to feel like a real happy hour experience. Grand total: $12.17 for about 2 glasses of good quality wine and 3 samosas each. At a bar or restaurant, even during happy hour, we would have spent around $20-$25 including tip. Plus we had chutney left over and didn’t have to deal with noisy professionals elbowing for a table.